There will be beer, wine, dumplings and hip hop inspired furniture and housewares! A month full of design shows is coming up and it kicks off with a show produced by my classmates and I. My work will also be in two more shows following that. Below are all the deets. Please come out and support if you can! Design C.L.O.T. will be the main show exhibiting all of my thesis work. The other shows will include half of the designs I've done for thesis and some of my past work. I'll be updating on the progress of all the designs once things have calmed down. Thanks for being patient! Exhibition of student work from industrial design, graphics, illustration, interior design, digital media, jewelry and other Pratt departments. 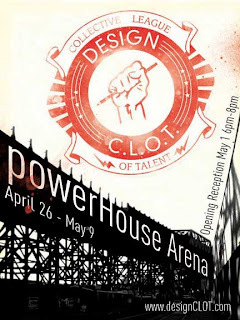 * Friends and Family Reception Wed May 12, 5 p.m. - 9 p.m.
there and there for design c.l.o.t.! thanks! hopefully amidst the chaos remember to take pics! sweet! see ya there shar!